This is a delicious way to use leftover turkey, and it makes a very special meal. Serve these crepes with asparagus spears and a salad, or add a rice dish for a heartier meal. The ingredients list might look daunting, but it is easy to make in steps. 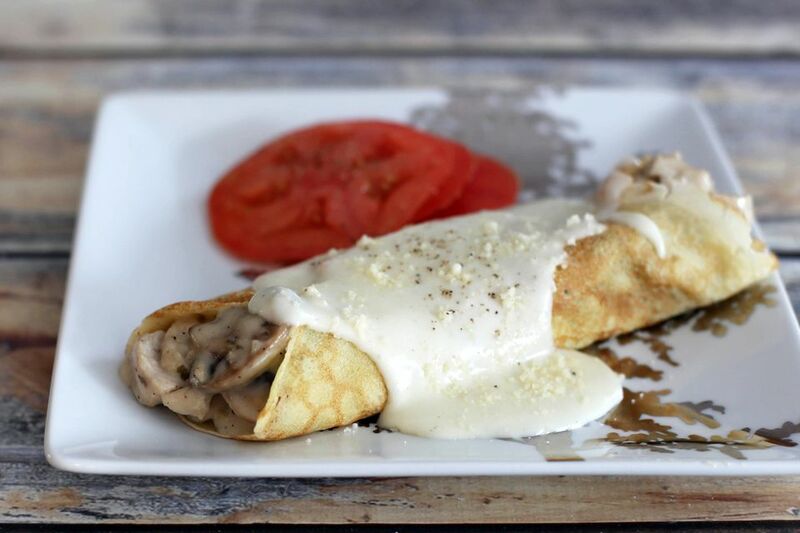 The crepes can be made ahead of time, or use purchased savory crepes. The sauce can also be made earlier in the day and refrigerated. Just reheat it when you need it for the filling. Put the eggs, milk, flour, butter, and salt in a blender. Process until smooth. Alternatively, whisk or beat with an electric mixer until smooth. The batter will be thin. Put the batter in a bowl, cover, and refrigerate for 30 minutes to 1 hour. Take the batter out of the refrigerator. Heat a 7-inch nonstick skillet or seasoned crepe pan over medium heat. Brush with a little oil or spray with nonstick cooking spray. Pour 1/4 cup of batter into the pan and swirl it to coat the bottom. Cook for about 1 1/2 to 2 minutes, or until set and the edges begin to brown. Carefully turn it with a thin spatula and cook for about 30 seconds longer. Remove to a plate. Continue with the remaining batter, putting a sheet of wax paper between the crepes. In a medium saucepan over medium heat, melt the butter. Add the flour and dry mustard and cook, stirring, for 1 minute. Gradually whisk in the milk. Cook, whisking constantly, until the sauce thickens. Add the 3 tablespoons of Parmesan cheese and salt and freshly ground black pepper, to taste. Reserve 1 cup of the sauce for the filling and set the remaining sauce aside. In a large skillet or saute pan, heat the butter and olive oil over medium heat. Add the shallots and cook, stirring, for 1 minute. Add the mushrooms, thyme, and sage and continue to cook, stirring, until mushrooms are tender and browned and any liquids produced by the mushrooms have evaporated. Add the garlic and cook for 1 minute longer. Add the turkey and cook, stirring, until the mixture is hot. Add the reserved 1 cup of sauce to the turkey mixture and stir to blend. If desired, add 1 tablespoon of sherry or vermouth. Heat until the sauce is hot and begins to bubble. Fill four crepes with the mushroom mixture and fold over. Arrange the filled crepes on plates. If the remaining sauce is very thick, thin with a little milk and reheat. Spoon some of the remaining sauce over the filled crepes and sprinkle with more Parmesan cheese.